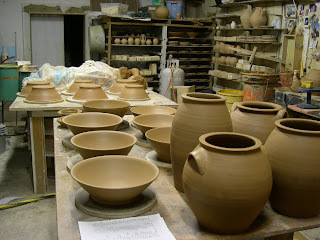 I am so excited to share with you a new blog about pottery and creativity written by Virginia potter Catherine White. I have been a big fan of Catherine's pottery after being introduced to it at ArtistPotters.com and after meeting Catherine and her partner Warren Frederick here at Penland. Catherine writes about her pottery and the processes of creativity involving in this blog titled "Rough Ideas". I hope you will go there and see for yourself. Enjoy. Matthew Anders(l) and Keenan Hoilman(r) screw the tin down as I take this picture. I spent the day with my feet on the ground handing tin up to the guys. I'm no good on high places, even with a good knee. So for those keeping score, check off the roof! I turned feet on the big bowls last night, although I had to slam a Pepsi for fuel. As I was getting a promo mailing out there, I thought, "Why not practice some brushwork on the envelopes?" 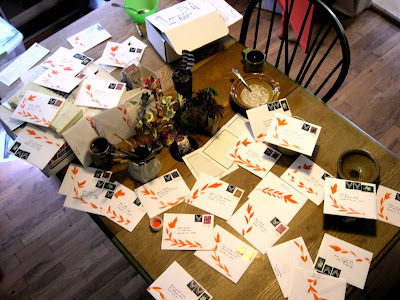 So combining my tedious envelope stuffing with a little brushwork and my love of mail art...voilà (french for "voilà! "): FUN! If you are one of the lucky people on my carefully selected demographic mailing list, good for you. If not, sorry. Maybe I can get into the greeting card business and open an Etsy store like this one. After dinner and some time catching up on my reading I returned to the old Micaville studio for some late night pottery. I finished a big jar and then tended to some big bowls by turning over and covering up with plastic as I will be putting up roofing tomorrow. I sat and looked around for a while, listening to some news and then threw a few lids for the jar. At the end of the "hump" of clay I was working off of, I had a tiny amount left on the wheel head. I could have cut it off, but sometimes this little bit of clay can become a nice little unexpected pot. So I threw what I call a 'monkey' dish, a little side dish, I guess you could say. 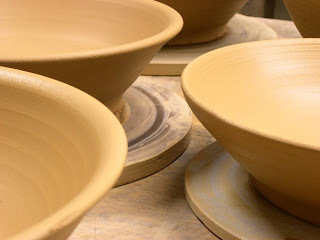 Then I thought of Jenny Mendes and her beautiful little hand pinched bowls. So I decided, since we are having a show together at AKAR this summer, that I would try to make some little bowls inspired by Jenny's. Well here is a picture of some of the ones I quickly threw. I didn't quite capture the intimate feeling of Jenny's pots(yet). Being pinched, they have a nice softness and wobbliness. 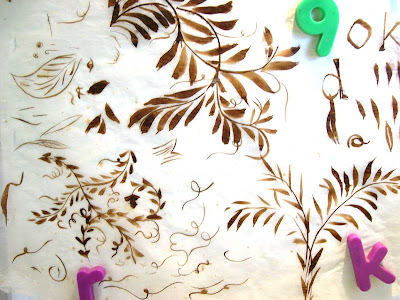 She then paints a motif in the center that is always alluring. That will be another challenge, since I don't really paint figuratively. It will be fun to try. Here is one of Jenny's I found at her website, jennymendes.com. It's just 3" wide and about 2" tall! We're back online! Hooray. It's so nice to be back on the Mac after a few days at the library's machines. 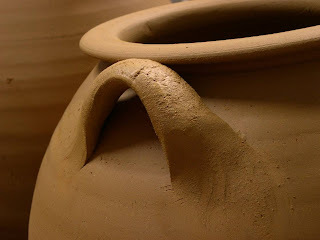 At any rate I have been catching up with all the pottery blogging and am happy to see that everyone is still out there making beautiful pots (all over the world!). 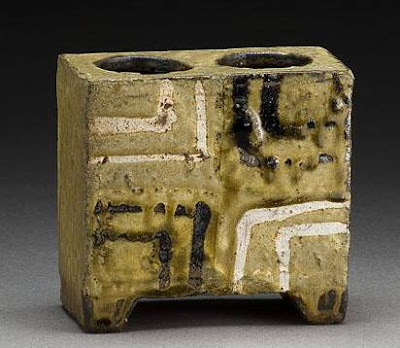 My neighbor Shawn Ireland has a beautiful new website that showcases his pottery work and I have just looked at some really nice ones here. I do hope you enjoy them as much as I did. Shawn and I were resident artists at Penland a few years back. I was just over at his place the other day and saw him mixing up a new batch of clay. I'll have to stop by and see what he's making next week. 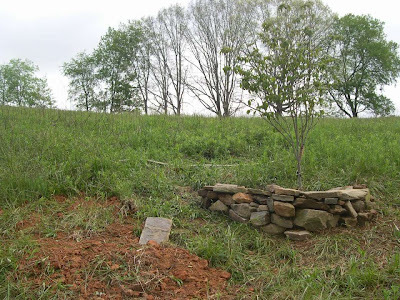 It's a drizzly rainy day here in downtown Spruce Pine, and I have brought a few pictures for you on my jump drive. Still without service at home, but no problem. 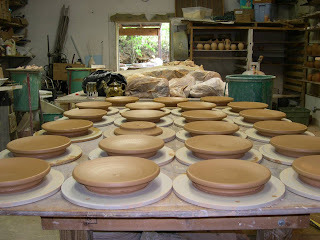 My good friend Sam asked me if I make pots to show on the blog or blog to show what i make in the studio...Hmmm. I most certainly make pots for the blog! My friend Emmett has some beautiful work going to SOFA in NYC. Check out the portfolio here. My Internet service has been interrupted and I apologize for not keeping everyone up to date. I am well and I write this from my local public library in downtown Spruce Pine, North Carolina. Hopefully I will be back online soon. I hope everyone is well. What does one do with a blown out piece of pottery? Patch the Holes? Abosolutely not! I just wedged up the clay and threw it back on the wheel. The clay was a little stiffer and worked much better. 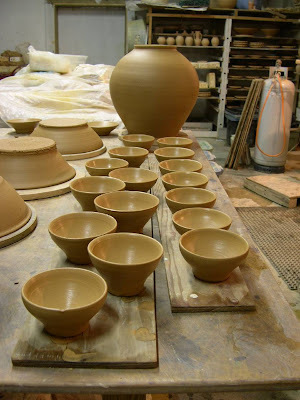 This episode reminded me how the subtle difference clay hardness makes with different scale pots. This was 10 lbs. of clay and a little too soft, hence the torch. I covered lightly with plastic overnight, which 'evened' out the moisture in the pot, and rewedged the clay, using the wire to cut the clay as I wedged. On another studio note...Here are a couple of lid treatments for a round jar. I know which one I like better, but let me know which is your pick. I wanted to let you know about my new t-shirts in cases you wanted to mention them on your blog. Attached a couple pictures. They'll be available on Thursday at noon along with new pots and a winking cowboy postcard. 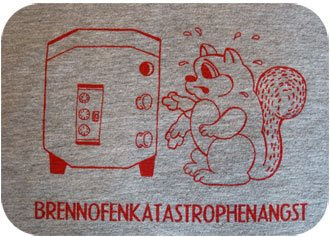 The German word [Brennofennkatastrophenangst] describes the fear and anxiety one feels when something goes horribly wrong in the kiln, yet the results are unclear and one has to wait and wonder through sleepless nights, many hours or days, for the kiln to be cool enough to open. 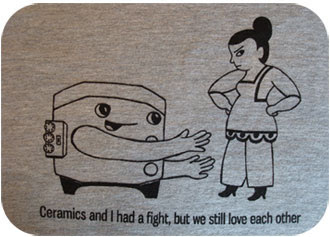 There are women's and men's cuts and 2 designs, though the ceramics fight design comes in a boy and girl version. $25each. But of course(said in french accent) Ayumi! I can't wait to get mine, seeing as German was my first language and angst will be my last. Coincidentally, we received an invitation to our friend's Susan and John's wedding next month. 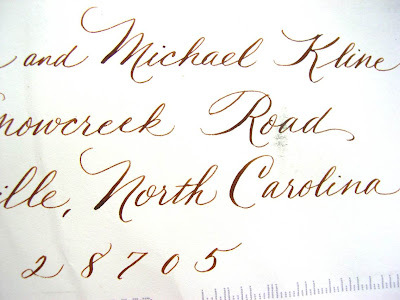 On the envelope was this beautifully written calligraphy. 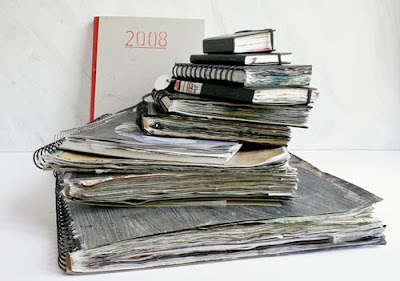 Since I was thinking about brushwork and sketchbooks, I thought I would share this with you. It made we want to write this blog with a pen and ink. 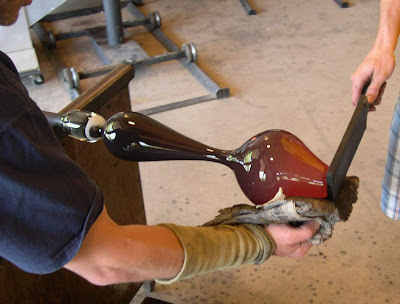 Meanwhile back in the old shop...What not to do with your big torch! I was tired. It was late. No one was hurt. 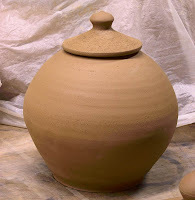 This a great tool for getting a jump on your bisque firing! But I would recommend throwing the pot first. 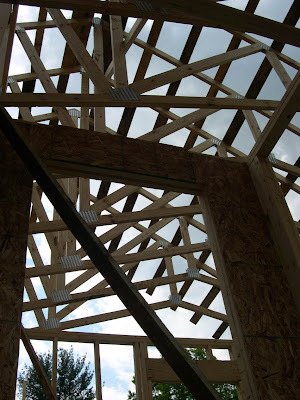 And for those who like triangles, this view through the trusses of the new shop. Alex has written a great post on his blog "Notes from an Apprenticeship" that I think you would enjoy reading. 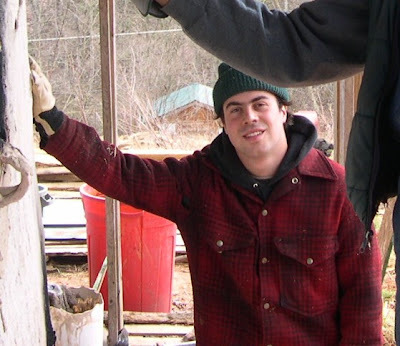 It's introspective, frank, and goes to the heart of being a potter. We all headed over to see Matt Jones and crew on Big Sandy Mush Road this evening. They were wrapping up the two day firing of that beast of a kiln. 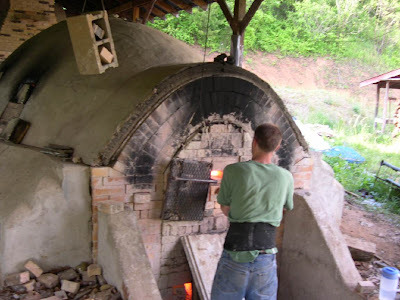 Below is a picture of Matt side stoking the kiln in the last hour. 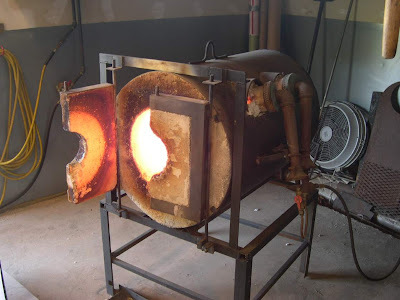 The picture below gives you a sense of the size of this kiln. Matt stands about as tall as me at 6'3" . Of course the kids wanted to hang out where the action was, at least until the candy bars and potato chips ran out. That's Matt and Christine's kids Linden on the far left, and Sarah Frances next. 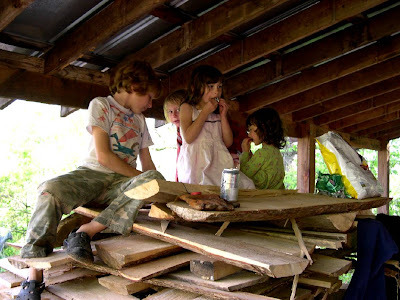 Then my girls Evelyn and Lillian sitting on one of the remaining piles of pine slabs. Below Alex Matisse is loading up salt on planks to be stoked. This will be the last time he will do this for Matt. He's headed for Kutaya, Turkey and Pittsboro, NC, respectfully. Some may think it a little 'cheesy' but this is how I cut the rims of my plates. The cheese cutter is one I bought at the grocery store and took the depth cutter off and and exchanged the wire with a stainless braided wire. The braided wired is very fine and makes it easier to cut. I always cut the foot of the plate first and then cut the rim. You may notice at the beginning that the plate is still pretty floppy. If you try to cut the foot ring after the rim of the plate it will crack. You will only notice the cracks after it is fired. 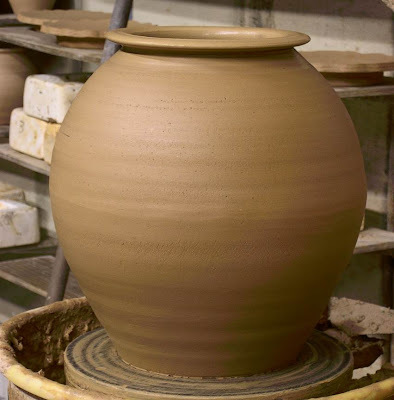 The pressure you exert on the foot ring to trim "spreads" or compromises the rim.As in many of these pottery processes, timing is everything. At the end of this short video are a few examples of these fired plates. I hope you enjoy it. Here is a little video I put together for ya'll. It's a little campy, but I needed a good laugh. enjoy! 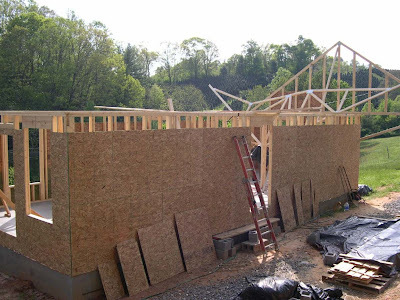 We laid up the first truss yesterday evening and will put up the rest today. I couldn't sleep last night thinking about all the money I'm spending on this studio. 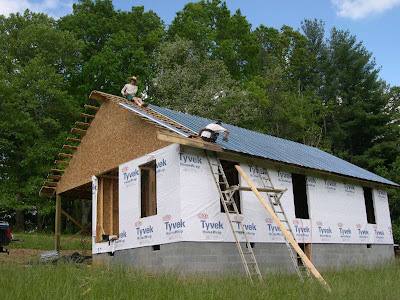 And the funny thing is it's not a lot as new construction goes. I'm just not that comfortable writing these big checks, especially when I'm paying the builders more than I make. I'm in the wrong business. As I finally slumbered off I thought to myself how nice it's going to be to make pots here at home. One of my blogging goals was to have a place to share thoughts as I make my work, a place that I can talk out loud. I wanted to simulate what happens at workshops when I am asked questions. So this blog is, in a way, an ongoing FAQ, where I am frequently asking the questions, and hopefully coming up with some answers. 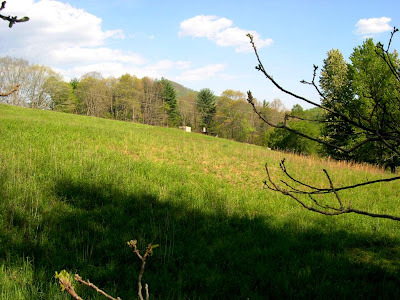 Another hope for the blog was that it would be a self revelatory process. It would give back ideas, open up conversations with readers and myself. And thankfully it has been all these things, and more. I am realizing that there are a lot of folks like me out there. I have met a lot of people who have told me that they read the blog regularly. There are friends who have told me that they don't read the blog, that's ok, too. Another thing that is happening is that I am reading a lot of other pottery blogs. I guess I didn't know that so many potters were blogging. What a great surprise! It's great to read about, and see what everyone is up to, what we are looking at for inspiration, what we read, etc. 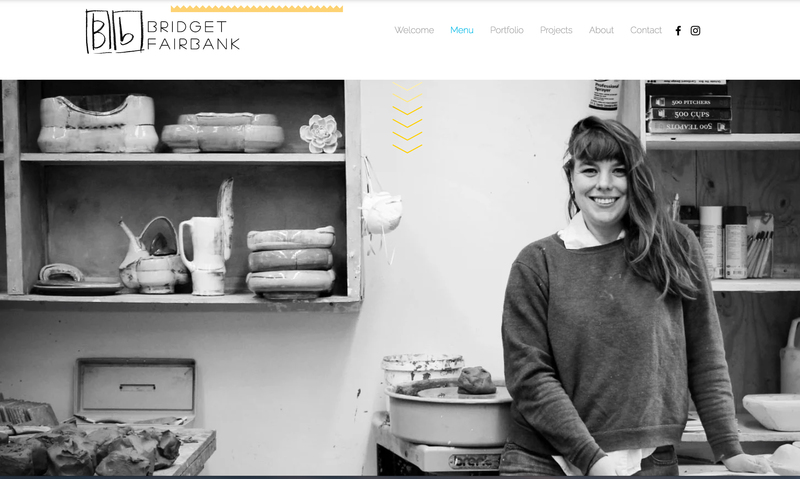 I started out thinking that I would keep the blog strictly focussed on pottery. I think I've stuck to that mostly, but I'm finding that potters do all sorts of things besides standing at a wheel throwing pots. 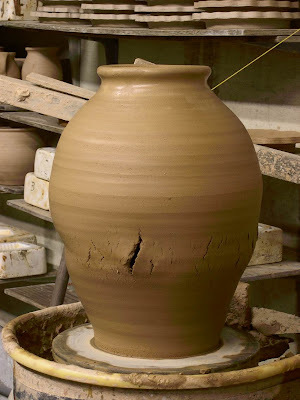 I certainly have become aware through this blog that I don't throw pots everyday. When it comes to reporting from the studio there aren't always fresh pots sitting on the table to photograph. It all comes back to the many hats we, as potters, have to wear to get those pots made. 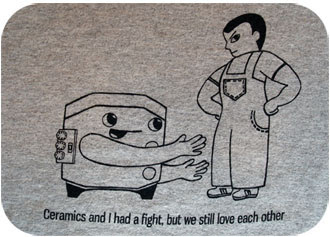 And that is what I am finding interesting in the pottery blogs. I guess I just wanted to admit these findings to myself as much as report report them to you, the reader. For the record, I did get my hands dirty today in the studio, I just thought I would spare you the obligatory photo of the table full of pots. It's ok, right? It's all in a potter's life. Thanks for reading. I just found out that today is Ken Sedberry's birthday! 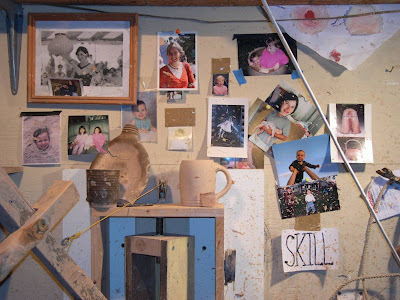 I first met Ken way back in 1989 on a field trip to his studio and kiln from my Penland Spring Concentration Class. 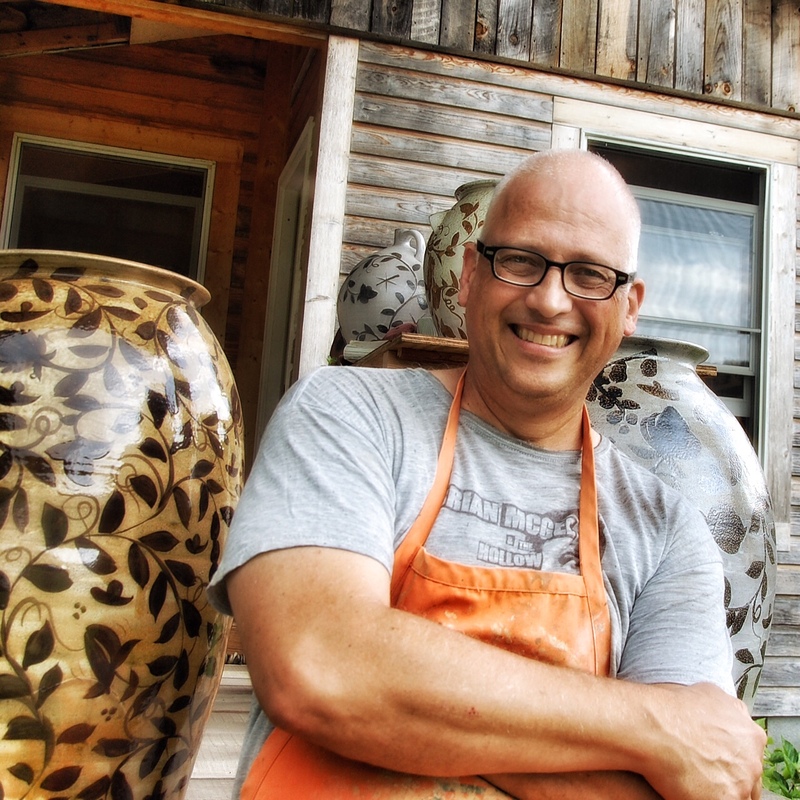 Ken's still making some great pots and he's another of my very talented neighbor's here in Bakersville, NC. 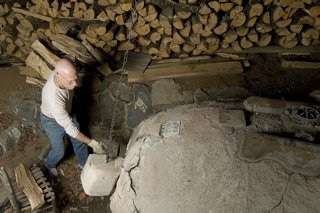 Ken encouraged Mark Peters to use castable refractory to build his wood kiln, and Mark in turn showed me how to use it. Happy birthday Ken and many, many more. I made a few pots this afternoon after running a few errands and meeting my 'scholar' friend Ellen Denker for lunch at the Hilltop Diner in Burnsville. We caught up with each others doings and talked pottery and such. Ellen has been a curator of museum shows about the Arts and Craft movement, material culture, folk art, and now she's living in High Point directing the North Carolina Furniture Heritage Project at the High Point Museum. Today she told me about meeting a certain Dr. Gougelmann, an ocularist from New York. Read his story here. (which leads to this, circling back to talk of pottery) There's never a dull conversation with Ellen! By the time I had all of the clay pugged it was time to head home, but I made a couple of quick plates to check the clay. It still felt a little airy. As I mentioned in a long forgotten post, my pug mill is pretty old, but still churning away. There isn't a vacuum pump to take the air out, so I still have to wedge the clay . That's OK with me. Tom Turner says to let the clay sit a day before using it. I will see if its any different today. Our lovely Ruby passed away early Thursday morning in Asheville. Ruby apparently had a growth on her neck that suddenly made it difficult and impossible to breathe. Stacey took her to the animal hospital in Asheville and they did what they could to help her. We are all in shock. Anyone who has met Ruby won't soon forget her, if ever. She was a fixture at Penland while I was a resident there, (until she was found on top of a table in the Pines lapping away at someone's dinner). Ruby's hysteria will be missed around here and we will always remember her for her companionship, loyalty, enthusiasm, singing, and loving nature. 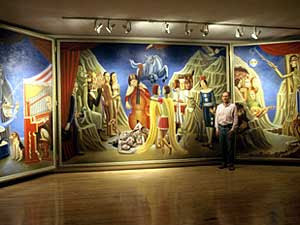 Ruby was immortalized in the painting "Circus of the Night" by John Snyder. 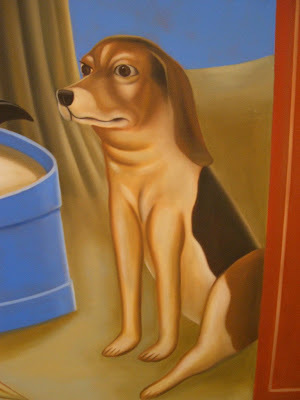 The above image of Ruby is a detail of John's 24' painting from 2005. John always had a milk bone in his pocket for Ruby and whenever John came around Ruby gave here most enthusiastic greeting. Ruby was laid to rest underneath this dogwood tree Thursday afternoon. We had a little rain last night and this morning, so Matt and Sarah may not be here till this afternoon if then. Here is where we stand with the studio. Matt brought some nice old doors and we'll figure out where to put them. I'm off to the old shop to pug clay and maybe get a few pots spun. It's all I can do after pugging fresh clay to take some over to the wheel and check it out. Have a good Friday. Not much to say about mixing the clay this afternoon, except that it was a lot of trouble moving the clay around from old studio to new studio to Penland to this mixer and back again. Isn't it what we potters do? Moving stuff around all the time? Anyway, I guess I have to do things wrong a few times to figure out the right way. 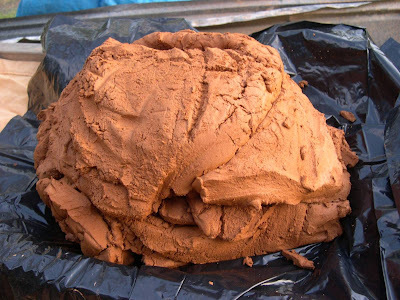 Next time instead of making the red dirt slip and then drying it on the racks, and then schlepping bags of fire clay and red dirt across God's creation, I will make the fire clay/feldspar slip, since it is 50% of the total, and blend it 1:1 with red dirt and dry the combined on the racks, then pug it, then throw it! How do you spell duh? Thanks for allowing me this post to figure this out. 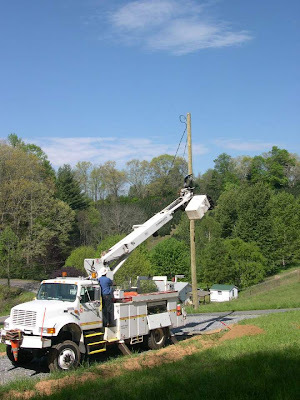 Sorry for the bad pun(s), but I can't help myself...The electric company installed the power pole today and the road crew replaced the culvert from our pond to the other side of the town road. So there was a little "Busytown" feel to our little corner of the world. I visited Greg Fidler to measure the windows again and took a few pictures of him at work in the glass shop. 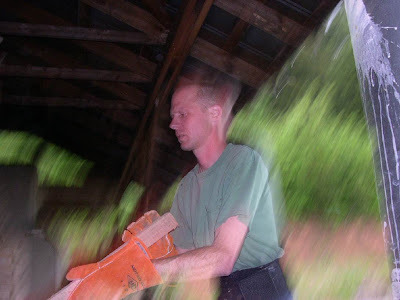 Greg using a wet wad of newspaper to shape against the paddle. Also Greg has this in his shop, can you guess what it may be? More on clay mixing later. 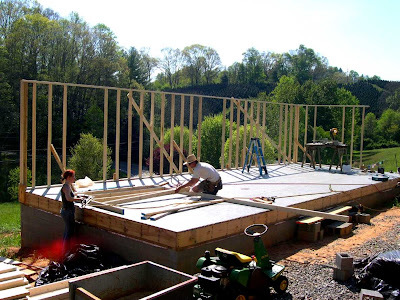 Matt and Sarah got to work on the framing today and here are a couple of pictures. My girls and I have had the afternoon together and enjoyed a tractor ride to the back nine. 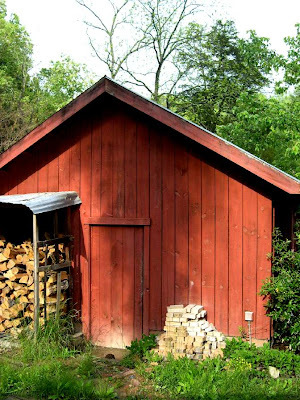 Below is the studio/kiln viewed from afar with the current color of Spring. 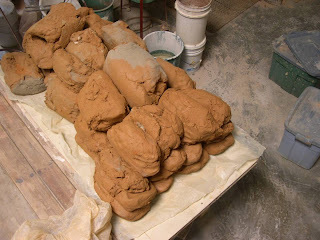 Tomorrow may be my clay mixing day. I have a little over 800 lbs of red dirt ready to go. That will make about 1600 lbs of clay for this session and the June firing. That should be plenty. I want to make some tiles for the show at the Clay art Center in Port Chester, NY. And I can't wait to get back to the wheel. Leave a comment if there is something you would like to discuss. Until next time...Thanks so much for reading. Not a lot of pottery was made here today, sorry to say. 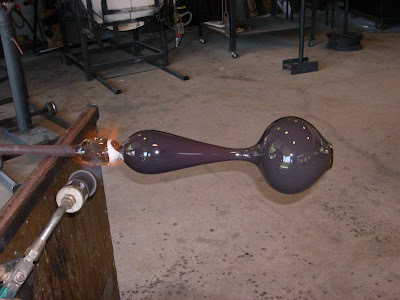 But, I manged to score some nice windows from my glass blowing friend, Greg Fidler. He is redoing his house and had a bunch of nice windows that happened to fit my plans. Thanks Greg! 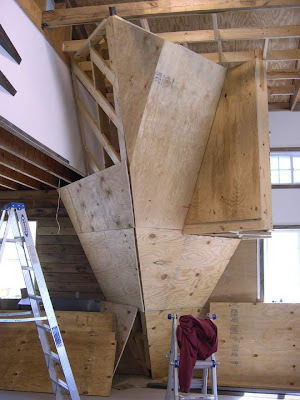 I'm waiting to hear from the building inspector before proceeding with construction. 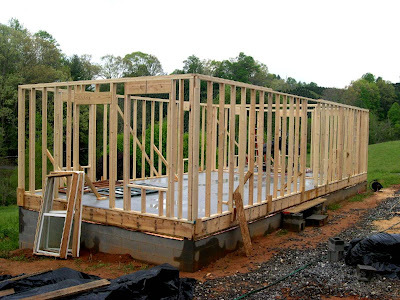 Framing will hopefully start tomorrow. I got a call from the truss manufacturer and they will be ready by next Monday. So hopefully in a week we will be putting the roof up and it will start looking like a pottery workshop. 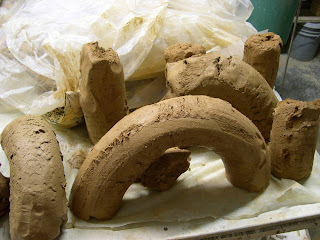 I have been tending to my clay racks and had a couple of pictures of the stages of the process. 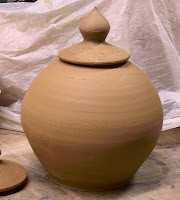 The first shows the clay as it looks when it's ready for bagging. 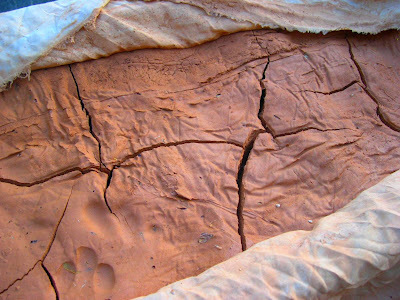 Since the red dirt is pretty short it cracks open when it dries. Although the dirt is cracking it is still pretty soft. I remove it from the racks as soon as I can handle it without it sticking too much to my hands. 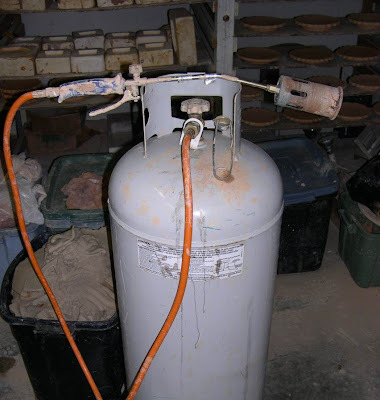 Since I will be mixing it in a paddle type mixer with the other materials, fireclay and feldspar, I am bagging it and taking it to the mixer up at Penland, which they so kindly let me borrow. 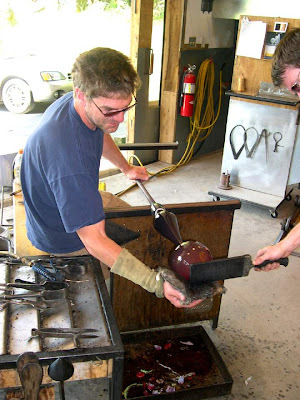 Most of the classes at Penland use premixed clay, so the mixer sits idle most of the time. So until I buy my own mixer I will be very, very appreciative to Susan Feagin, the clay coordinator at Penland. As I unloaded to racks I decided to mix more dirt with a slightly new technique, always tweeking the process. I tried blunging the clay a bit thicker than usual, so there would be less water that needed to be removed in the racks. 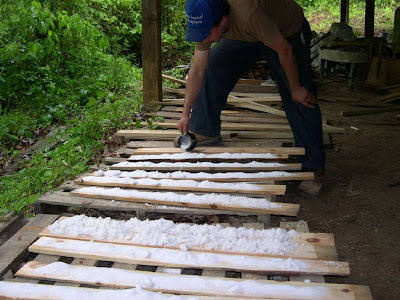 The only problem I had was sieving the small rocks, mica, roots, sticks, etc. from a thicker slurry. I had noticed that if I slam the sieve a few times the finer "clay" would go through. So I went ahead and poured the thick slurry through the sieve, and surprisingly about 75% went through the screen without assistance, but the remaining took a bit of additional water and steady pushing through. But it was quite a bit less water overall which was the aim. All this was probably just an excuse to be up at the kiln/studio complex during my favorite time of the day. 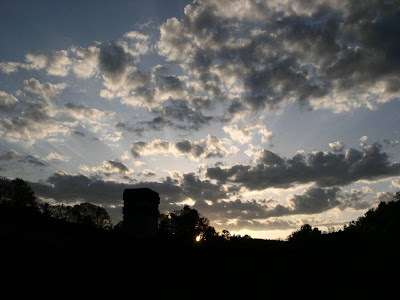 I snapped off this shot just as the sun was going over the hill around 8 p.m. I will be mixing a new batch of clay on Wednesday. Cheers.